Home Nutrition Tips Want to Lose Fat? Skip Carbs at Breakfast! Want to Lose Fat? Skip Carbs at Breakfast! Scientific research shows that eating carbs for breakfast can actually help store fat and keep you from burning calories. Conventional breakfast foods are packed with simple carbs and additives. I bet you keep hearing that it’s necessary to eat carbs for breakfast to get energy and focus, and the more the day goes by, the fewer sugars you should take in. While you definitely should be eating carbs following your workouts, you don’t need them first thing in the morning. 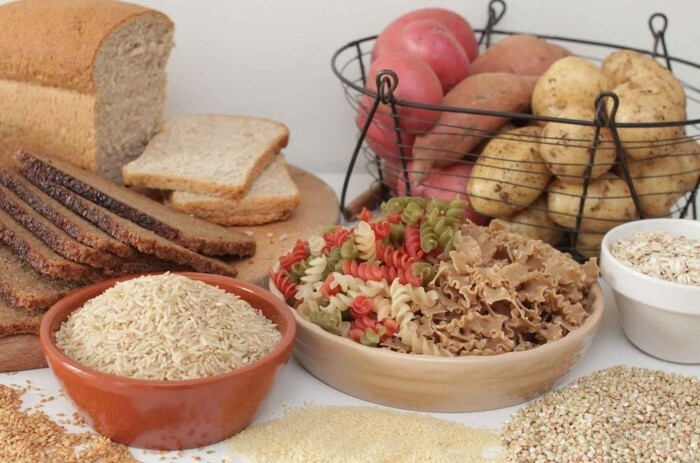 You’re probably shocked to find out that eating carbohydrates in the morning can lead to weight gain. Let me explain why this happens. Earlier in the day, insulin sensitivity is higher in both muscle and fat cells. Having a carbohydrate-rich meal for breakfast will cause your body to store fat. Ghrelin, the hunger control hormone, is released in your body throughout the night, which stimulates the production of growth hormone and makes you hungry. As this happens, your body starts to burn fat for energy and reduces the protein breakdown for use as fuel. Growth hormone levels peak about two hours after you wake up as long you don’t spike insulin levels by eating carbs. In other words, you start the day burning fat. Even when you’re working out, your body will burn more calories than normal on an empty stomach. What happens if you eat carbs for breakfast? First of all, your insulin levels, as well as your blood glucose levels, will increase, which reduces fat burning for the rest of the day. At the same time, your cortisol levels will remain high. This sudden insulin spike stimulates the production of new empty fat cells while lowering your levels of growth hormone and ghrelin. The bottom line is that eating carbs earlier in the day will have a negative impact on both fat burning and muscle building. Not only it lowers your growth hormone levels, but increases blood sugar levels and leads to weight gain. Now that you know why you shouldn’t eat carbs early in the morning, you’re probably asking yourself what you can eat for breakfast. The first rule is to never eat anything that comes out of a vending machine. This is quite obvious, right? The second rule is to have a protein-rich breakfast consisting of hard boiled eggs, nuts and seeds, lean beef, bacon, cottage cheese, yogurt, ricotta, tofu, or protein shakes. Lean meat is carbohydrate-free and contains lots of protein. A high-protein breakfast will keep you full longer and increase your metabolic rate, which will cause your body to burn more calories throughout the day. A recent study conducted at the University of Missouri has shown that a breakfast rich in protein helps reduce unhealthy snacking in the evening and improve appetite control. According to the Institute for Food Technologists, people who eat eggs in the morning reduce their caloric intake for up to 36 hours after having breakfast. Other studies indicate that eating Mexican burritos or steak in the morning are more likely to help you stay slim than breakfast cereals. Just think for a minute – breakfast cereals are loaded with sugars, while steak is a great source of protein and amino acids. Mexican burritos contain sugars and fat, but at least they are rich in protein and good carbs from rice and veggies. Low-carb, protein-rich diets have been associated with greater weight loss compared to high-carb, low-fat eating plans. What if you don’t have time to make breakfast? Start your day with a protein shake! You can also mix some egg whites to increase your protein intake. If you’re going to the gym, take protein along with a pre-workout supplement. Avoid eating high glycemic foods in the morning because they will elevate your insulin levels. Make sure you always have some eggs or meat with veggies for breakfast. How Much Muscle Can You Build Naturally? How many hours after you wake or eat breakfast is it ok to eat carbs then? At least three hours after you wake up or two hours after having breakfast.